Marking the first year of the Power of Together strategic plan, 2015 was a tremendous year of continued growth and progress for UF Health. In this “year-in-review” issue of OTSP, we highlight achievements in each of the colleges. Next week, we’ll do the same for our research centers and institutes, as well as our hospitals. Dean: Isabel Garcia, D.D.S., M.P.H. 2015 marked a year of change and accomplishment for the College of Dentistry in all aspects of our mission. In February, A. Isabel Garcia, D.D.S., M.P.H., joined the college as the seventh permanent dean after retiring from the U.S. Public Health Service in 2014 as a rear admiral, lower half. She was the deputy director of the NIH’s National Institute of Dental and Craniofacial Research, where she served as the institute’s coordinator for global health and as director of NIDCR’s Residency Program in Dental Public Health. The college’s predoctoral program and advanced education programs in endodontics, oral and maxillofacial pathology, oral and maxillofacial radiology, orthodontics, pediatric dentistry, periodontics and prosthodontics prepared for accreditation and hosted a site visit from the Commission on Dental Accreditation Sept. – Oct. 1. While the official report will not be received from the CODA board of directors until February 2016, the site visit went very well and full accreditation with no reporting requirements for all eight programs involved is expected. For the seventh consecutive year, our D.M.D. students achieved a 100 percent success rate on Part I of the National Board Dental Examination, which fulfills the educational requirement for dental licensure. The college’s dental educational programs have a reputation of excellence within the profession nationally and internationally, and continue to receive a high number of applications from exceptionally qualified applicants. The predoctoral (i.e., D.M.D.) program received almost 1,500 applications for 93 available positions. For the 56 positions available within the advanced education (i.e., “residency”) programs, the college received 1,012 applications. UFCD also benefits from the increasing strength and frequency of the interdisciplinary educational collaborations within the college and with other health professions at the Health Science Center. This year, we took several steps to further reinforce a humanistic culture where diversity and differences are understood and respected by faculty, staff and students by launching a survey to assess cultural climate and launching the StrengthsQuest program for entering D.M.D. students, and faculty and staff who work with them. Overall research funding increased by 15 percent to $15.4 million, with federal grant awards comprising $14 million. The college’s research enterprise measured by federal funding is ranked 7th nationally among dental schools, with the majority of NIH funding in the Department of Oral Biology, a Top 10-ranked program. 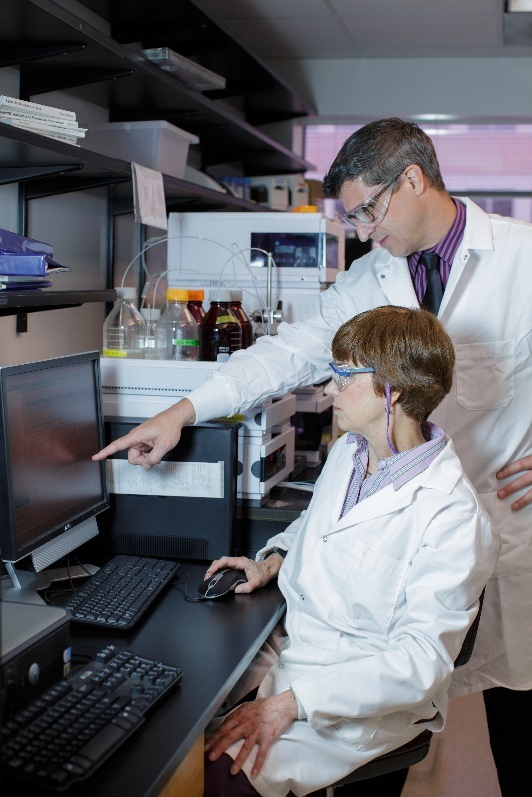 Oral biology also has strong collaborations within UFCD, the university and nationally. UFCD completed its first preeminence hire, Jose Lemos, Ph.D., previously an associate professor at the University of Rochester School of Medicine and Dentistry, who joined UF in August. His research is on the characterization of the stress responses by streptococci and enterococci and fits into the Metabolomics focus area of the UF Preeminence initiative. He is one of two UF preeminence hires working in this field. The research program has several venues to encourage student participation in research and to encourage research as an eventual career path for students. Five students won national awards and/or fellowships, and one took second place at an international research meeting. During the 2015 fiscal year, the college completed 133,865 patient visits at UF-owned dental centers in Gainesville, Hialeah, Naples and St. Petersburg, marking a 20 percent increase over the past five years. Clinical collections were $18.6 million and represented 27.6 percent of total college revenues, an increase of 2.5 percent. UFCD’s dental centers continue to serve as a major safety-net provider in the state; more than 100,000 of patient visits completed last year were for patients living at or below 200 percent of the federal poverty level. Each year, the college conducts a patient satisfaction survey to gauge patient feedback relating to quality of care, trust, customer service and other benchmarks. The results continue to be overwhelmingly positive and show an ongoing reduction in the waiting time for a first appointment, a 95 percent rating for “very good or excellent” for overall quality of care, and a 90 percent “always considerate” rating for treatment by our health care providers. Dean: Michael L. Good, M.D. Many impressive achievements by faculty, students and staff at the UF College of Medicine made 2015 a standout year for our medical school. After decades of dreaming, years of planning and fundraising and 20 months of construction, the state-of-the-art George T. Harrell, M.D., Medical Education Building opened its doors to our students. Designed to achieve full implementation of the modernized medical school curriculum, this new academic home for our medical students and physician assistant students has injected a tremendous positive learning energy into the entire college. A detailed account of this incredible journey and facility is the subject of a recent issue of On The Same Page. During 2015, the two-year medical school reaccreditation process culminated with a full eight-year accreditation from our accrediting body, the Liaison Committee on Medical Education. Record numbers of applicants applied to our medical school (4,462), to our physician assistant school (1,548), and to our graduate program (335). Match Day 2015 was also highly successful, with all UF medical students receiving an internship or residency, most at residency programs associated with top 50 medical schools, and a strong group of incoming interns and residents — many from top 50 medical schools — selected the UFCOM and UF Health for their residency training. "Growth" is the appropriate descriptor for our clinical practice and research programs in 2015. The UFCOM physician practice grew to nearly 742,000 ambulatory visits, 50,000 inpatient admissions and over 32,000 major surgical procedures. Last year, our clinical faculty cared for a patient from every county in the state of Florida, and from every state in the United States. Funding to UF research faculty from the National Institutes of Health increased for the seventh consecutive year. Two new centers were established by UFCOM researchers, including the Alzheimer's Disease Research Center, co-led by Dr. Todd Golde and the Mt. Sinai Medical Center; and the Wellstone Muscular Dystrophy Center, led by Dr. H. Lee Sweeney. The UF Diabetes Institute, led by Dr. Mark Atkinson, received another UC4 award to study human islets in Type 1 diabetes, and three UFCOM investigators in the Diabetes Institute received new NIH U01 awards. 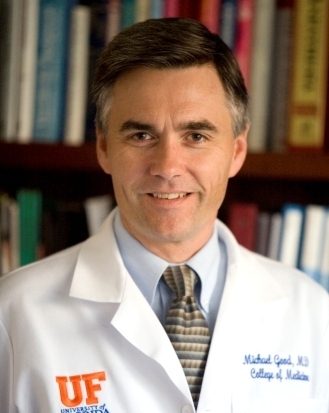 Dr. Marco Pahor co-leads a study with Wake Forest Baptist Medical Center and four other institutions titled “Enabling Reduction of Low-Grade Inflammation in Seniors (ENRGISE).” Dr. Barry Byrne received funding for a Phase II study of AAV9-GAA gene transfer in Pompe disease. Drs. Christopher Forsmark, Kenneth Cusi and Steven Hughes received a grant to be a part of the Consortium for the Study of Chronic Pancreatitis, Diabetes and Pancreatic Cancer. Our NIH Clinical and Translational Science Award was renewed, which funds our UF Clinical and Translation Science Institute, led by Dr. David Nelson. Additionally, UFCOM faculty received two Patient-Centered Outcomes Research Institute, or PCORI, awards last year. The OneFlorida Clinical Research Consortium, led by Drs. Elizabeth Shenkman and Bill Hogan, is a statewide partnership, and Dr. David Nelson leads the PRIORITIZE Study of Oral Agents for Hepatitis C to study the effectiveness of three medications used to treat hepatitis C.
The UF Health Cancer Center was named a Center of Excellence by the Florida Department of Health and Florida Gov. Rick Scott, and Dr. Jonathan Licht was appointed as director of our new UF Health Cancer Center, where he will lead our National Cancer Institute center designation initiative. Faculty are the lifeblood of the UF College of Medicine, and in 2015, we grew to over 1,300 faculty in our college of 19 clinical and 10 science departments. More than 150 individuals joined our faculty team in either incremental new or replacement positions. Nearly 40 faculty were hired with funding from the UF Preeminence initiative or the UF Health Cancer Preeminence initiative. Three department chairs were appointed in 2015: Dr. Tim Morey, a 1992 graduate of the UF College of Medicine, chair of anesthesiology; Dr. Sonal Tuli, chair of ophthalmology; and Dr. Michael Okun, a 1996 graduate of the UF College of Medicine, chair of neurology. Dr. Tom Rowe, a 1982 UF College of Medicine graduate, was appointed as associate dean for graduate education and director of the Interdisciplinary Program in Biomedical Sciences. As the College continues to grow, we reaffirm our commitment to diversity and inclusiveness in all mission areas. These successes and growth in each of our missions led to a strong financial performance for the college in fiscal year 2015. Total college revenues approached $900 million. Over $12 million was awarded in over 900 faculty incentives. As in past years, so many of our achievements were made possible because of key partnerships with UF Health Shands, UF Health Jacksonville and the Veterans Affairs Medical Center. 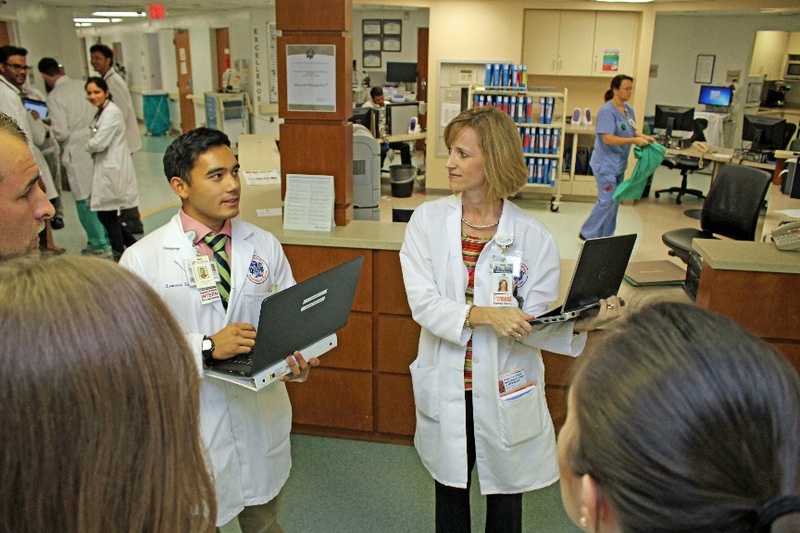 UF Health Shands contributed significantly to the Harrell Medical Education Building and provided generous support funds to 34 departments and units in the college through 162 specific funding commitments. Both UF Health Jacksonville and the VAMC continue to play key roles in support of our educational programs. The VAMC also acquired additional funding for new residency positions and now funds over 190 residency positions in our joint residency training programs. As we close the calendar on 2015, we look forward to 2016 with great anticipation as the UF College of Medicine celebrates its 60th anniversary (1956 to 2016). Clearly, as our soon-to-be published history volume will detail, we are a College of Medicine with "A Legacy of Innovation and Collaboration since the 1950s." Thanks to all who contribute to that great legacy, whether during 2015, in the past, or in the years to come. 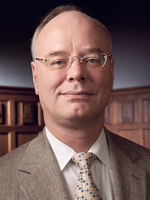 Dean: Daniel R. Wilson, M.D., Ph.D. It is timely to again measure recent attainments as College of Medicine–Jacksonville faces an exciting future. Through the past year, aims for our mission areas were surpassed in nearly every sphere — excellent education further improved, research rose and patients had greater access to our superbly talented faculty. Moreover, public awareness grew of how our truly essential services to the region are at risk due to inadequate local payment. But without doubt the highlight of the year clearly was the highly successful launch of the new UF Health North. 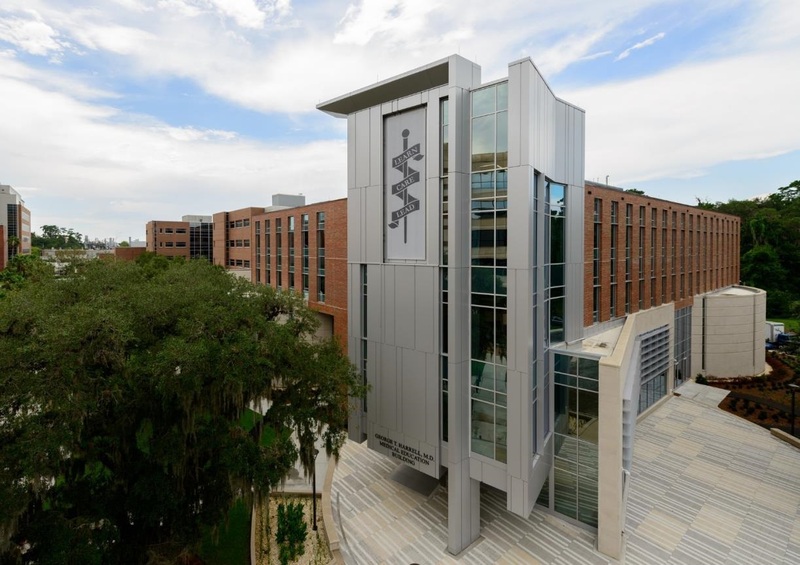 UF–Jacksonville by most measures is Florida’s third-largest venue for medical education, training some 30 percent of UF M3 and M4 medical students as well as 372 residents and fellows in 45 programs. All GME programs remain fully accredited as is a new fellowship in microvascular surgery and the Next Accreditation System is underway with GME self-studies and robust annual reviews of all programs noting both best practices and opportunities to improve. We also host unique and growing interprofessional interactions with colleagues in Nursing and Pharmacy and for engagement of highly diverse populations in the region. UF Jacksonville had another good year in research overall, notably as federal funding increased substantially,including population-based and community engagement studies. Research collaborations with the colleges of Nursing, Pharmacy, and Public Health and Health Professions grew via projects that address health and health care disparities. Involvement with the Clinical and Translational Science Institute renewal invigorated cooperative research between investigators here and in Gainesville, expanded community engagement efforts, and other CTSI initiatives such as One Florida and Personalized Medicine. UF faculty are clear leaders of community coalitions for translational and population-based participatory research to address quality of care and outcomes. This leadership is evident in large grants such as the SAMHSA System of Care Initiative and the CDC Partnerships to Improve Community Health. Our already sprawling clinical enterprise is growing via a strategic plan focused on success in the North, optimization of the main site and novel service lines. Our array includes 15 on-campus clinics, 25 primary care centers and 27 specialty satellites. Ambulatory visits exceeded 600,000 (1.2 million, including hospital clinics), surgical volumes are up sharply and the payor mix has improved markedly. Operations ended the year well ahead of an aggressive budget. Clearly the big news of 2015 is the outstanding launch of UF Health North. All services have far exceeded expectations. This key component in our clinical strategy is situated near the airport and River City Marketplace and has a large emergency department, state-of-the-art radiology and laboratory, an ambulatory surgery center and the first in America midwifery-led birthing center within an academic department of obstetrics as a unique draw. UF Health has also built a hospital-based Rehabilitation Center, Sleep Center, and Infusion Center. The new medical office building launched with services based in three “shared” clinical suites: Surgical, Medical and Multispecialty. The North faculty ramped up 45 percent by the end of the calendar year as 21,000 patients were seen in 43 weeks to the end of 2015, with nearly 10,000 new to UF. The busiest services are Cardiology, Orthopedics, Neurology, General Internal Medicine and GI, with the 18 others rising nicely. For 2016, the biggest challenge is to optimize clinical space to expand in the face of strong demand. In July, Obstetrics & Gynecology, Occupational Medicine and Orthopedics will move to new offices to “unpack” the first-to-open clinics that are already busy. Obstetrics & Gynecology will be next to the Birthing Center and Pediatrics, creating a floor for women and children. Occupational Medicine will move from Medical Services and Orthopedics from Surgery to allow expansion of subspecialties in Medicine and Surgery in the initial areas. The Emergency Department story is even more remarkable. Daily visits projected for the end of 2015 were exceeded by nearly 100 percent and are now typically over 90 per day — as was projected for Year 4! The North has also bolstered hospital and practice with an average of 10 transfers daily to the main hospital. The Phase 2 ground-breaking in November celebrated these successes while looking forward to the opening of the first hospital tower in 2017. Perhaps most significantly, the North has fostered a full embrace of UF Hospitality and creative adaptability with pride and optimism imbuing all of UF Health-Jacksonville with a remarkable “can-do” spirit. Each and every day I am amazed by the astonishing work of UF to sustain our key missions of patient care, education, research and service. It was a great year with great prospects for the future. In 2015, the College of Nursing continued to grow in all of its missions, making strong progress in the second full year of our strategic plan. We have much to celebrate but also so much for which to look forward. 2016 marks the college’s 60th anniversary and I feel very fortunate to be serving as Dean as we mark this milestone. In 2015, we reorganized our CON administrative structure and created two new academic departments — the Department of Biobehavioral Nursing Science and the Department of Family, Community and Health Systems Science. Since 2014, we have increased private giving to $3.75 million, which was 312 percent of our goal. We also increased faculty recognition and awards. Currently 25 percent of our faculty are fellows of the highly prestigious American Academy of Nursing — a figure matched by few other schools of nursing. In 2016, we will focus on increasing diversity and building a more inclusive environment for our faculty, students, staff and alumni. Our faculty governance organization has already established a Diversity Task Force charged with helping our various stakeholders understand and embrace the concept of diversity. We continue to grow all of our academic programs, expanding our undergraduate enrollment by 22 percent. In 2015, the college established an R.N.-to-B.S.N. program exclusively for UF Health registered nurses to obtain their bachelor’s degree from UF, thus helping the hospital system reach the strategic goal of increasing its pool of B.S.N.-educated nurses. 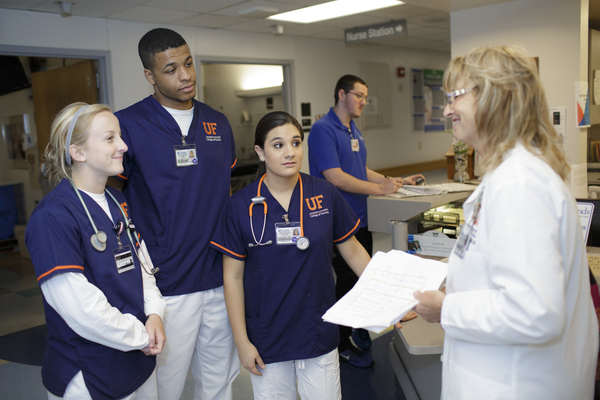 In 2016, we will expand this program to nurses at UF Health Jacksonville. 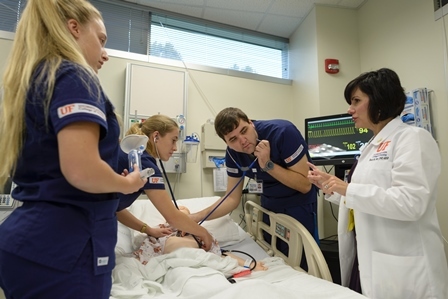 In addition, the program is now part of UF Online, the university’s premiere online learning institution, which expands it for nurses across the state of Florida. We have grown our Academic Partnership Unit, which offers an innovative model of clinical nursing education for B.S.N. students partnering with UF Health Shands nurses and clinical staff. 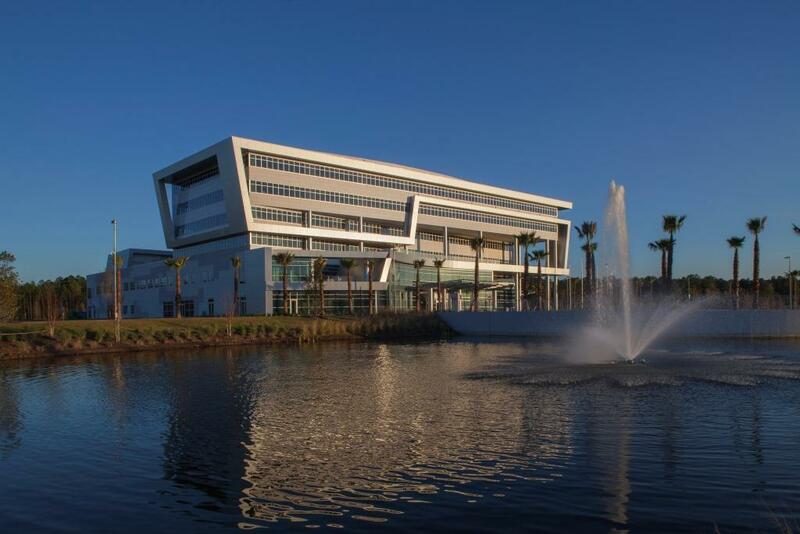 In 2016, we will expand this program to UF Health Jacksonville to accommodate our new cohort of accelerated B.S.N. students. This model has already been presented as a model at national conferences hosted by the National League for Nursing and the American Association of Colleges of Nursing. We continue to increase use of simulation across B.S.N. and Doctor of Nursing Practice programs. Our students are benefiting from our own simulation activities as well as the new state-of-the-art Harrell Medical Education Building’s facility and equipment, which help to strengthen interprofessional education across our disciplines. We streamlined and revised our D.N.P. curriculum and are working to do the same in our Ph.D. curriculum. In 2015, we filled our fourth and final endowed faculty position, including two that were hired under UF’s Preeminence initiative. Through this initiative, two preeminent nurse researchers are now at UF and will enhance the UF College of Nursing and UF Health shared research agenda, especially in nursing informatics and palliative care. These internationally renowned scholars bring a wealth of knowledge and expertise to our faculty and are already making an impact on building our community of scholars. We have increased in all levels of productivity: total number of grant submissions by 68 percent; total research funding 49 percent; NIH research funding by 32.5 percent and grant submissions and funding by non-NIH sources by 89 percent. We have increased the number of joint research appointments, including partnering with our UF Health system to increase collaboration between research and clinical practice. We have also expanded the number of new interdisciplinary collaborative research teams overall, giving us a strong presence in areas such as palliative care, sickle cell and wound ostomy. Archer Family Health Care, our nurse-managed clinic, continues to use its nurse-led interprofessional care team at Archer Family Health Care, which, in turn, increased immunization status, mental health visits, prenatal services and clinical volume. More D.N.P. students have also completed their capstone projects at the practice. In addition, this past year, AFHC initiated a patient portal, giving patients critical access to their medical records. The college has increased overall clinical revenue generation and the number of faculty members with practice appointments. Our partnership with the UF Health system continues to be a focus across all missions with shared leadership in the nursing division and the college. 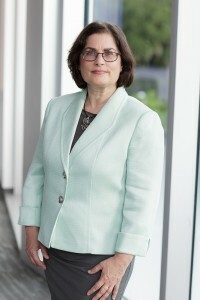 Dean: Julie A. Johnson, Pharm.D. In 2015, the College of Pharmacy introduced a new curriculum for entering students in the college’s Doctor of Pharmacy, or Pharm.D., program. Our approach to training the next generation of pharmacists focuses on interprofessional, team-based learning with an emphasis on delivering patient-centered care. At all three of our campuses in Gainesville, Jacksonville and Orlando, first-year students are engaged in blocked courses taught by faculty across disciplines that introduce future pharmacists to new practice models and clinical experiences. In addition, a tandem co-curriculum is providing students with skills to enhance self-awareness, interpersonal communication, patient advocacy and leadership. The Florida Society of Health-System Pharmacists, or FSHP, recognized the College of Pharmacy’s Gainesville student chapter as its Student Society of the Year during FSHP’s annual meeting in Orlando. The Alpha Omega chapter at the College of Pharmacy’s St. Petersburg campus received an honorable mention award for its Pharm-CORP National Project at the Kappa Epsilon National Convention. College of Pharmacy Jacksonville student Renad Abu-Sawwa earned the Extraordinary Student Volunteer Award at the 2015 UF Impact Awards. The award recognizes a student who has been consistently dedicated to serving the University of Florida and local communities during the past year. Abu-Sawwa helped a local nonprofit, the Muslim Care Clinic, open a pharmacy department for underserved patients. Mohammad Akbar, a graduate student in the department of pharmaceutics, received the 2015 Graduate Student Research Award in Biotechnology from the American Association of Pharmaceutical Scientists. Yoonyoung Choi, a graduate student in the department of pharmaceutical outcomes and policy won the best poster award in the database spotlight session at the 31st International Conference on Pharmacoepidemiology and Therapeutic Risk Management. The International Society for Anti-infective Pharmacology honored third-year graduate student Amelia Deitchman, Pharm.D., with its Graduate Student Award during the society’s annual meeting. The American College of Clinical Pharmacology selected four College of Pharmacy graduate students, Jiexin Deng, Jatinder Mukker, Snehal Samant and Mohamed Solayman, as 2015 Student and Trainee Abstract Award winners at the organization’s annual meeting. The College of Pharmacy’s online programs continue to serve working professionals in a significant way. The online programs provide access to the University of Florida to those who would otherwise be unable to attend. Examples include working professionals, parents with young children or family members needing care, those with disabilities and those with geographic constraints. With 28 percent of enrollments in our online programs representing minorities, and with students from 40 countries, we have extended the reach of the University of Florida well beyond its typical student body. Jane Aldrich, Ph.D., a professor of medicinal chemistry, and Jay McLaughlin, Ph.D., an associate professor of pharmacodynamics, received multiple federal grants, including a $2.5 million grant from the National Institutes of Health for the development and testing of peptidic kappa opioid receptor ligands as potential treatments for drug addiction and a $2 million grant from the U.S. Department of Defense to develop novel peptide antagonists as treatments for substance abuse. Additionally, McLaughlin secured a $2.2 million grant from the National Institute on Drug Abuse to investigate how an HIV protein, Tat, produces neurochemical changes to increase the rewarding and addictive effects of opioid painkillers in patients with HIV. Charles Jason Frazier, Ph.D., an associate professor and graduate coordinator of pharmacodynamics, was awarded a five-year grant totaling $1.875 million from the National Institute of Mental Health. The goal of his project is to reveal how the release of oxytocin in the brain ultimately affects mood and social behavior. Rob Huigens, Ph.D., an assistant professor of medicinal chemistry, led a team of researchers that developed potent new compounds that can kill dangerous bacterial biofilms present in recurring and chronic bacterial infections. Julie Johnson, Pharm.D., dean and distinguished professor, and Larissa Cavallari, Pharm.D., an associate professor and director of the center for pharmacogenomics, presented major research findings at the American Heart Association’s Scientific Sessions that supported genetic testing in certain heart patients. Their research found that genotype-guided antiplatelet therapy led to significantly better cardiovascular outcomes. Eric Krause, Ph.D., an assistant professor in the department of pharmacodynamics, secured a five-year, $1.875 million grant from the National Institutes of Health’s National Heart, Lung and Blood Institute. He will study how slightly elevated sodium levels cause neurochemical changes that reduce the impact of psychological stress. Faculty in the College of Pharmacy continued a tradition of excellence in scholarship, research and education in 2015. The college added 12 new faculty hires, including four research faculty hired through UF’s Preeminence initiative. The Preeminence hires in the area of drug discovery and development included Jane Aldrich, Ph.D.; Jay McLaughlin, Ph.D.; Thomas Schmittgen, Ph.D.; and Jurgen Bulitta, Ph.D. In addition, the college welcomed Kenneth Klinker, Pharm.D., as the first faculty hire in the college’s new shared responsibility model with UF Health. The college is developing innovative clinical pharmacy practice models that partner clinical pharmacists with academic clinicians to strengthen the education of future pharmacists. Klinker serves as a pharmacy specialist in infectious diseases at UF Health and is taking on additional roles training pharmacy students and residents. In addition, a national search is nearing completion for associate dean of student affairs. The new associate dean will replace Michael McKenzie, Ph.D., who will retire after 43 years on faculty and 31 years leading the office of student affairs. Rhonda Cooper-DeHoff, Pharm.D., M.S., an associate professor of pharmacotherapy and translational research, was awarded the 2015 Distinguished Associate Award by the American College of Cardiology. Hartmut Derendorf, Ph.D., a distinguished professor and chair of the department of pharmaceutics, named UF Alumni Association’s 18th Distinguished Alumni Professor. Yousong Ding, Ph.D., an assistant professor of medicinal chemistry, was named one of the 35 Ralph E. Powe Junior Faculty Enhancement Award recipients by Oak Ridge Associated Universities. Carinda Feild, Pharm.D., an assistant dean of the UF College of Pharmacy St. Petersburg campus, was selected as a Fellow into the American College of Critical Care Medicine. Oliver Grundmann, Ph.D., a clinical associate professor of medicinal chemistry, has received the Janet K. Poley Award for Leadership and Innovation in Distance Education during the American Distance Education Consortium 2015 symposium at Oregon State University. 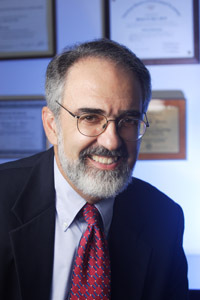 Abraham Hartzema, Pharm.D., Ph.D., a professor and Perry A. Foote Eminent Scholar, received a U.S. Pharmacopeial Convention Award for outstanding contribution to the USP standard-setting process for membership of the 2010-15 Nomenclature, Safety and Labeling Expert Committee. Michael Katovich, Ph.D., professor of pharmacodynamics, was awarded the 2015 Nello Pace Award by the International Society for Gravitational Physiology. 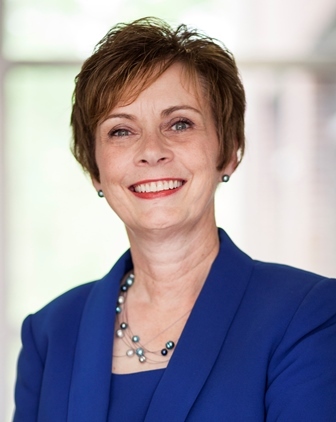 Julie Johnson, Pharm.D., dean and distinguished professor, was named as one of Thomson Reuters Highly Cited Researchers of 2015. Lawrence J. Lesko, Ph.D., F.C.P., a professor of pharmaceutics and director of the Center for Pharmacometrics and Systems Pharmacology, was honored by the ISoP Awards Committee and Board of Directors with the ISoP Leadership Award. Folakemi T. Odedina, Ph.D., a professor of pharmacotherapy and translational research, led a team that was the lone recipient of the U.S. Department of Defense’s Prostate Cancer Research Program Population Science Impact Award. Steven Smith, Pharm.D., M.P.H., BCPS, a clinical assistant professor of pharmacotherapy and translational research, was presented with the American College of Clinical Pharmacy, or ACCP, 2015 New Investigator Award in October. Dean: Michael G. Perri, Ph.D.
Dr. Glenn Smith, a neuropsychologist from the Mayo Clinic Medical School with expertise in dementia, started as chair of the department of clinical and health psychology. Dr. Susan Nittrouer, a speech-language pathologist from Ohio State University, and a nationally renowned expert on language acquisition, started as chair of the department of speech, language, and hearing sciences. Dr. Tara Sabo-Attwood, associate professor in the department of environment and global health and national expert in toxicology, was appointed chair of the department. The college completed a new five-year strategic plan that builds on our strengths and focuses our efforts to achieve excellence in education, research and service. We also completed a comprehensive move of faculty and staff office and research space to maximize synergies, bring departments together and improve research facilities. Somnath Datta, Ph.D., joins the department of biostatistics from the University of Louisville, in the area of genomics. Susmita Datta, Ph.D., joins the department of biostatistics from the University of Louisville, in the area of metabolomics. Glenn Smith, Ph.D., from the Mayo Clinic in Minnesota, was appointed chair of the department of clinical and health psychology in the area of neuroscience and brain. Anthony Maurelli, Ph.D., joins the department of environmental and global health from the Uniformed Services University of Health Sciences in the area of select agents. Dr. Gordon Mitchell, a professor in the department of physical therapy who was hired under the neuroscience and brain preeminence initiative, launched the Center for Respiratory Research and Rehabilitation in August 2015. The center’s mission is to create a world-renowned program devoted to understanding physiological challenges to respiratory motor control in health and disease, and to translate this knowledge into strategies of respiratory rehabilitation. During 2015, PHHP continued to grow its research enterprise and compete successfully for extramural support.In the past year, PHHP gained significant ground in NIH grant funding compared with peer institutions. The college jumped from 19th to 15th among the top 50 accredited schools of public health, and from eighth to seventh among the 15 public AAU universities. Total grant funding increased from $24.8 million to $26.1 million, and awards from NIH rose from $11.4 million to $16 million. 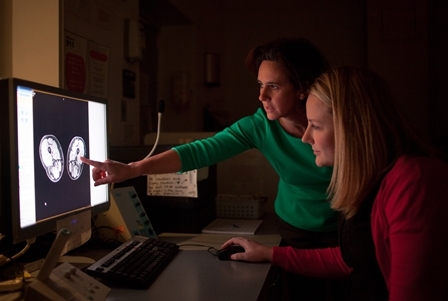 Krista Vandenborne, Ph.D., chair of the department of physical therapy, received a $7.15 million NIH grant to support continued studies of the use of MRI to track Duchenne muscular dystrophy disease progression. Ira Longini, Ph.D., a professor in the department of biostatistics in PHHP and the College of Medicine, played a major role in the design and analysis of the WHO’s Guinea Ebola vaccine trial. Preliminary study results, published in July in Lancet, showed 100 percent effectiveness of the vaccine. In the largest autism clinical trial to date, Cynthia Johnson, Ph.D., an associate professor in the department of clinical and health psychology, and her colleagues found that a parent training program can reduce serious behavior problems in children with autism spectrum disorder by nearly 70 percent. The findings were published in JAMA. Glenn Smith, Ph.D., and a team of Alzheimer’s disease researchers and advocates received a three-year $1.56 million PCORI grant to develop a network that links patients and caregivers with scientists to accelerate the development of new Alzheimer’s treatments. In 2015, PHHP’s health care management program moved into the top 10 programs among AAU public universities and is now ranked ninth by U.S. News & World Report. It joins three other PHHP programs in the top 10: occupational therapy, which is ranked third, and audiology and physical therapy, both ranked fourth. PHHP continues to be a leader in federally funded training grants. In 2015, UF received a nearly $1 million grant from the National Institute of Neurological Disorders and Stroke to establish the Predoctoral Interdisciplinary Training in Movement Disorders and Neurorestoration program, led by Dawn Bowers, Ph.D., a professor in the PHHP department of clinical and health psychology, and David Vaillancourt, Ph.D., a professor in the department of applied physiology and kinesiology in the College of Health and Human Performance. The program joins five other federally funded training grants in the college. PHHP has been a leader in advancing “blended learning,” and has made important strides in pioneering a combination of online/virtual content and in-person content, including interactive class activities, to enhance student learning. At the close of the 2014-2015 academic year, the college had 67 courses that are either fully or partially blended. The college has also provided students with unique opportunities to advance their education in a global setting. Students in the master of public health program have completed internships in Haiti, Mexico and Switzerland, and students in the One Health Certificate program traveled to Kisumu, Kenya, to conduct field research as part of a cross-national team. PHHP has continued its commitment to provide health services and health promotion activities to individuals and communities. Through its clinics in speech pathology and audiology and clinical psychology, the college provided more than 50,000 patient visits. HealthStreet, a program that works to reduce disparities in health care and research, expands its work to Florida’s Putnam and Union counties, thanks to a new three-year $300,000 grant from the Florida Blue Foundation. Students in physical therapy, occupational therapy, and clinical and health psychology participated in Equal Access Clinics. Adam Reid, a doctoral student in clinical psychology and a master’s student in epidemiology, received the American Psychological Association’s Most Distinguished Graduate Student Award in recognition of his work organizing “free therapy night” at the clinic. Dr. Andrew Kane, an associate professor in the department of environmental and global health, was recently honored by the city of Cedar Key for outstanding service and dedication to the community. Dr. Kane is a member of the Healthy Gulf, Healthy Communities project — led by Dr. J. Glenn Morris — that has been studying communities affected by the Deepwater Horizon oil spill. Working closely with local fishers, Dr. Kane’s work addresses public health concerns about seafood safety in the Gulf of Mexico. In 2015, the PHHP Diversity and Inclusion Committee launched a Cultural Competence Workshop, a PHHP Open House for undergraduate students from underrepresented populations, and hosted its third Diversity Day. The keynote speaker in 2015 was Dr. Pedro José Greer, a professor of medicine and associate dean for community engagement at Florida International University. Dean: James W. Lloyd, D.V.M., Ph.D. Under the leadership of the college’s dean, Dr. Jim Lloyd, the College of Veterinary Medicine has continued to be actively engaged in strategic management, identifying and implementing new initiatives that will propel the college to preeminent status across all areas of its mission — teaching, research and clinical service. Many new faculty hires were made in 2015, including three individuals brought on board specifically through UF’s Preeminence initiative. The college continues to communicate with a wide group of stakeholders, both internal and external, to fine-tune ways in which it can better meet the needs of its many constituents, including alumni, donors, the practicing veterinary medical community and owners of animal patients seen and treated through the UF Veterinary Hospitals. After much preparation and anticipation, the college hosted an accreditation site visit in October. We anticipate receiving a final report in the spring of 2016. In the Office for Students and Instruction, Dr. Pamela Ginn stepped down from her position as associate dean. On an interim basis, that role will be filled by Dr. Tom Vickroy, our executive associate dean, during our active national search for Dr. Ginn’s replacement. Dr. Amanda House, an equine internal medicine specialist, is also serving as interim director of student affairs to supplement activities in that office. In April, Dr. Dana Zimmel joined the college’s executive leadership team as associate dean for clinical services and chief medical officer. For the past year, the College of Veterinary Medicine has strategically focused on implementing major changes to its overall research program, which is currently undergoing thorough review at all levels. This has included establishing a new philosophical basis for the graduate studies program, discussion of a newly designed academic program for the Ph.D. degree, increasing financial support for both our M.S. and Ph.D. programs, enhancing internal funding to graduate faculty via competitive grant competitions, providing greater administrative support for faculty submitting grants for external funding, and expanding available research space. This past year, the college expanded its graduate program, admitting 18 new students, nine pursuing M.S. degrees and nine pursuing doctoral degrees. As part of this expansion, the college added a new Resident-M.S. program in ophthalmology, joining Resident-M.S. programs in surgery and radiology. In addition, we have established new certificate programs in both shelter medicine and veterinary forensic toxicology and have expanded our online courses, which have been immediate international successes. In this vein, the UF College of Veterinary Medicine was recognized for establishing the very first veterinary forensic pathology fellowship program in the U.S. sponsored by the ASPCA. Crucial to our research enterprise has been the college’s active engagement in the hiring of new research faculty, basic and clinical scientists who bring innovative research programs and fresh perspectives to our college and its students. The college has also been deeply immersed in the university’s Preeminence initiative, leading the One Health program and being heavily involved in the mucosal immunology and the cancer programs. These programs provided the resources for the college to recruit Dr. Chris Vulpe from the University of California at Berkeley, where he was a professor of nutritional sciences and toxicology. Dr. Roy Curtiss, a member of the U.S. National Academy of Sciences, also joined the college faculty after leaving Arizona State University, where he was a professor of genomics, evolution and bioinformatics. Dr. Curtiss is well-known for vaccine development for both animal and human diseases and his research programs create new opportunities to expand future research collaborations between the College of Veterinary Medicine and other UF colleges. Dr. Liang Zhou, an associate professor of pathology, microbiology and immunology at Northwestern University, was the third preeminence hire for the college. His research programs in mucosal immunology will further strengthen the college’s leadership role in this important emerging area of biomedical research. The college continued to achieve significant gains this year, including stronger research partnerships with the College of Medicine in dermatology, cardiology and oncology, with Public Health & Health Professions in global health and toxicology, and with IFAS in animal sciences and aquatic animal health. Lastly, the Aquatic Animal Health Program co-hosted the 2015 Aquatic Ecosystem Health Conference, which consisted of back-to-back meetings of the Fifth Florida Marine Mammal Health Conference and the Third International Symposium on Ranaviruses. As of October 2015, 449 students were enrolled in the college’s D.V.M. program and 60 students were pursuing graduate degrees. 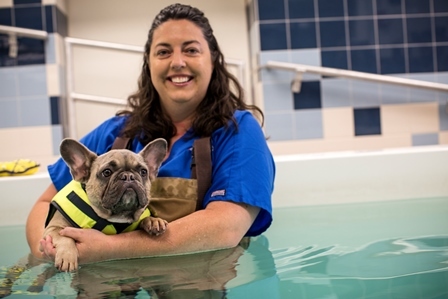 In addition, the college currently offers advanced clinical training to 46 residents, 16 interns and one fellow each year through the UF Veterinary Hospitals. As part of the college’s strategic plan, a new Clinical Skills Teaching Laboratory opened in August. This eagerly anticipated, state-of-the-art facility allows the college to provide a variety of clinical learning opportunities to veterinary students during the first two years of pre-clinical education in the professional D.V.M. program. Students will be able to amass broader technical skills to become better prepared and more confident in their abilities as they enter clinics. Curriculum review and revision is well underway, with first- and second-year students already participating in the new Clinical Skills initiative and in patient care. In addition, the college is now in its second year of participating in the Interdisciplinary Family Health Program, joining other colleges of UF Health in this worthwhile partnership between the university and the Gainesville community. For the first time this year, in partnership with Alachua County-area small animal practitioners, the college began offering an elective small animal practice-based clerkship, allowing students in their clinical rotations the ability to gain additional primary care experience in a real-world setting. This program commenced this fall and is already receiving rave reviews from students and practitioners. As mentioned, we also prepared for and hosted a full accreditation site visit and D.V.M. program review during 2015. Although the final outcome of this assessment will not be known until later this year, early indicators and feedback received have been positive. The UF Veterinary Hospitals made significant progress in many of the goals articulated in the past two years through our strategic planning process. These goals include enhancing the hospital’s reputation in specialty services, improving its operational model, maximizing student learning opportunities and investing in people. The college recently added technical support to expand the clinical trials program and continues to actively pursue accreditation of its diagnostic laboratories through the American Association of Veterinary Laboratory Diagnosticians. The UFVH launched a Patient Quality and Safety program in collaboration with the UF College of Medicine. This is the first program in the nation that uses advanced software to track patient-related events and provides a framework for enhancing patient care. A new outreach program, through which UF veterinary medical faculty members provide regional veterinary medical associations throughout the state with continuing education over dinner, has continued successfully this past year. Approximately 15 visits have been made to these private veterinary medical groups. A new radiology portal to allow veterinarians to view images of patients they refer is currently being developed. Operationally, the UFVH has improved clinical efficiency and customer services in the pharmacy and additional staff have been hired to help leverage doctor time and enhance the patient’s experience. The UFVH has continued to pursue innovative clinical teaching models through various means. A new clerkship, taught by four faculty members over a two-year period, provides specific learning objectives for students working in the hospital and eliminates the problem of students working as technicians without focused learning goals. The UF Small Animal Hospital received accreditation by the American Animal Hospital Association and also was designated a Level 1 veterinary medical emergency and critical care facility by the Veterinary Emergency and Critical Care Society. UF Pet Emergency Treatment Services in Ocala subsequently received Level 3 certification by the same group. Overall hospital caseload continues to grow. Net revenue for the UFVH grew by 5 percent and caseload grew 11 percent, with 32,260 in-hospital patients. There were 29,313 farm animals treated in FY15. 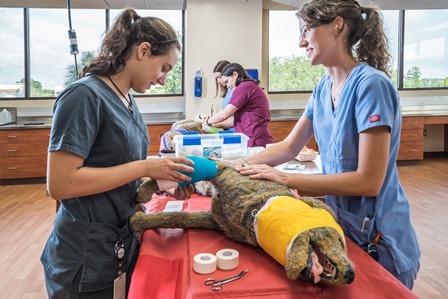 UF Pet Emergency Treatment Services in Ocala saw a net revenue increase of 15 percent and a 20 percent increase in caseload, with 4,975 patients. This past fiscal year marked yet another strong year for fundraising in the College of Veterinary Medicine — raising $13,289,127 in charitable gifts. Support from grateful clients contributed significantly to this success, providing approximately 32.73 percent of gifts, or $4,349,076. The Dean's Circle of Excellence continues to grow, having now raised more than $1,880,500 — a 13.96 percent increase in dollars raised since the previous year. Our new UF Veterinary Access Scholarship Program, a key college initiative to reduce student debt, already has amassed $3 million in its first year in cash, pledges and estate commitments. 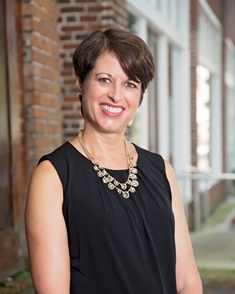 From a leadership perspective, Karen Legato was promoted to executive director of development during 2015, a reflection of the successes achieved to date under her leadership and a portent of even greater things to come. 2015 was indeed an extraordinary year. It is humbling and awe-inspiring to consider the extraordinary achievements of the UF colleges that are such an essential part of UF Health. Next week we will profile our UF Health hospitals and our research centers and institutes. Here’s to continued success in 2016!